This rich area rug presents with a rustic, authentic look inspired by traditional geometric kilim patterns in earthy hues of black, maroon, red, camel and beige. 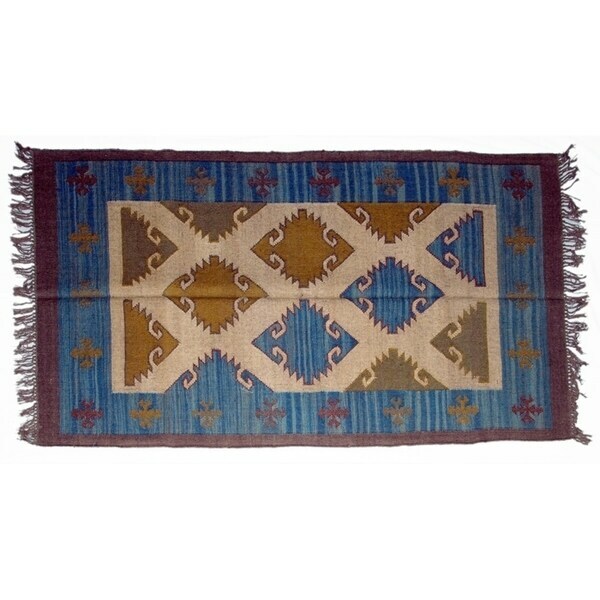 Hand-woven of wool and jute, this Indo rug will bring eclectic style to your home décor. Please keep in mind that wool jute rugs may initially shed and have a natural capacity to shed for several months after purchase. This is normal due to the nature of construction of most wool rugs and not a defect. Tip: We recommend the use of a non-skid pad to keep the rug in place on smooth surfaces. Story Behind the Art: Kilims are known as 'pile-less' rugs; the design is also known as 'slitweave.' Master Worldstock weavers in India have managed to replicate this pattern, using the same traditional techniques as their Iranian counterparts. Dimensions 72.0 In. X 48.0 In. X 0.25 In.